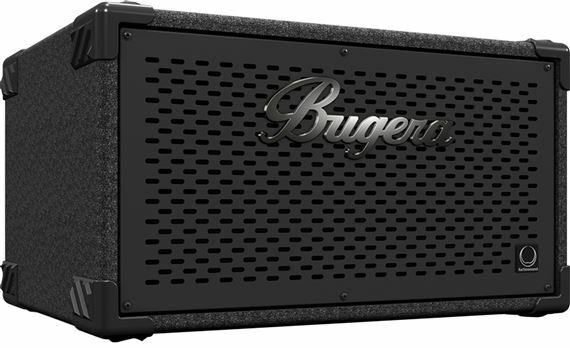 Shop Bugera BT210TS 2x10 Dual Bass Guitar Cabinet from AMS with 0% Interest Payment Plans and Free Shipping. 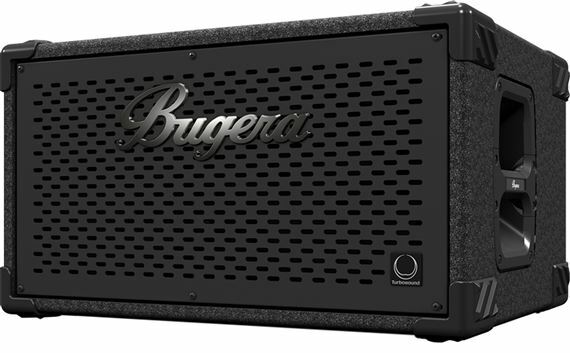 When you need really righteous bass tone, look no further than the BUGERA BT210TS. An ultra-compact and lightweight 1,000-Watt bass cabinet, the BT210TS comes loaded with two earth-shaking, British-engineered TURBOSOUND 10" speakers for massive low-end and mids – and a fully-adjustable 1" horn driver for pristine, sparkling highs. Rounded out with ultra-high quality touches, such as recessed carrying handles, integrated rollers, a shock-proof metal grille and reinforced corners, the BT210TS is one durable and impressive bass cab. Outstanding on its own, or when paired with our BT115TS, the BT210TS bass cabinet will shake you and your audience to the core! A world-leading British designer and manufacturer of professional loudspeaker systems, TURBOSOUND has been building cutting-edge speakers for more than 30 years, and won the venerable Queen’s Award for Innovation numerous times for their highly acclaimed loudspeaker designs. You will find TURBOSOUND’s distinguished products not only touring with the best-known international artists, but also in countless major venues worldwide. 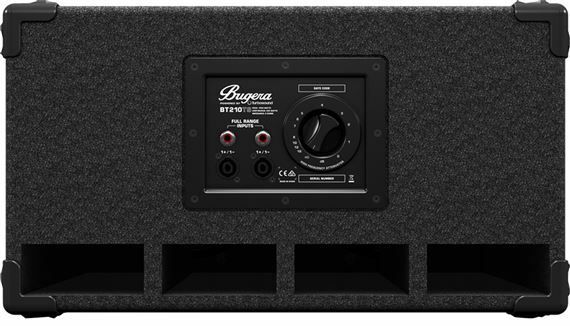 BUGERA is proud to incorporate world-famous, custom-engineered TURBOSOUND speakers into their products for the ultimate in high-quality audio reproduction. The BT210TS features two truly inspired 10" TURBOSOUND speakers with an impressive 1,000 Watts of total power handling, to meet all your amplification needs. Find out more about TURBOSOUND’s amazing legacy by visiting their extensive website. To match the ideal amount of top-end sparkle to your more-than-ample lows and mids, the 1" HF horn driver’s level is easily controllable via the high-quality rotary attenuator, located on the rear panel. Custom tailor your sound for vintage and classic tones all the way through modern, percussive styles. Lightweight speaker cabinets and amplifiers have become the biggest landscape-changer for the working bass player in recent years, and we worked diligently to perfect our newest entries into this exciting field. The BT210TS is a powerful performer with its extensive internal bracing and rear porting to provide rich and thick low-end response. Compatible with a wide variety of modern and vintage amplifiers, the BT210TS includes ¼" and professional twist-lock speaker connectors to keep all your bases covered. Recessed carrying handles and integrated rollers make for ultimate portability and ease of transportation, while the completely shock-proof, metal grille and superbly-reinforced corner-guards ensure excellent durability and protection. 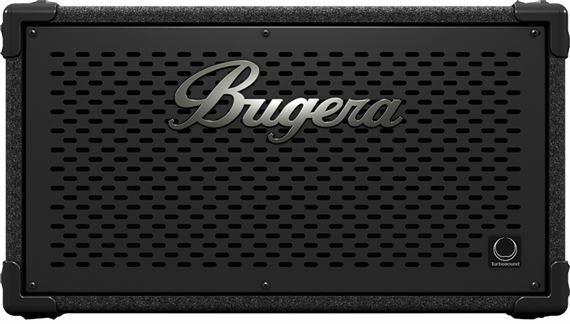 Designed and engineered by BUGERA Germany in collaboration with TURBOSOUND UK and covered by our 3-Year Warranty Program, the 1,000-Watt, ultra-compact and lightweight BT210TS bass speaker cabinet truly excels. More than powerful enough to be your one cabinet solution, while also pairing exceptionally well with our other bass cabinets, the BT210TS is in a class all its own. Really, really an incredibly pleasant surprise!! This thing is absolutely ridiculous! First of all.... I NEVER give reviews unless I am absolutely blown away by something. Well this is it. I have been a bass player for a very, very long time and have been in quest of the ultimate tone for just as long. I play through a Markbass Big Bang head (which is awesome btw) and had it going through a single 15" cab. I decided I wanted more roundness and punch and took a chance on this knowing I could return it if needed. Not a chance. This is THE SOUND! I am stunned. All I ever will need for gigs with my cover band. Enough headroom to play stadiums (which we don't :) but all the power you could ever need for our local bar gigs. Run a bit through the house and you're golden. Beautiful! Thanks Bugera and AMS for making my year! This cab sounds very mid forward but that's ok, it just makes it seem a lot louder. Turn up the bass and you get satisfying rumble. A lot heavier than expected. Great tone! Handles tons of power! Got two of these with an Ampeg dr500 head. Never have to turn up above 4! Fairly lightweight. Can't beat the price! AMS payment plan made it easy and Super fast shipping! Extremely portable! Small, but can handle lots of power! Clear sound! The best I’ve ever had. This amp does any and everything you need as a bass player. Wouldn’t trade it for the anything. Well made, tight sound, and for the money, it's a great value! Be aware though that the stated wattage is peak, not rms. This cab is actually only rated 400 watts rms. I use two of these along with the matching 15" cab running out of an Aguilar AG 700 (which will handle 2.67 ohm load) and the setup sounds great! I have these tens paired with a fifteen with the veyron tube powerplant, and I must say these tens will give you perfect tone! Other players have said not to mix cabs but in combo with the lows of a fifteen and the tones of the tens I have found my perfect setup. Cranks out perfect sound even when I get real loud and without any distortion. These tens sail over the competition I give you my word. The cab is built great and side by side to any other set without even without the fifteen they will overpower any other cab, trust me I have done it¡!!! Makes other player want to sell their high priced top rated gear, but they won't because they want the fancy name of a high end cab. I have owned these for over a year, and played over 20 gigs through 2018 at churches, weddings, bars you name it I've played it. They have over 600 hundered hours on them and ey are just getting better then more I break them in! Feel free to contact me if you have any more questions! Unless your looking for a name and an high price don't hesitate to buy you'll love them and your wallet will to! Charlie "owl"
Bought this for my son, qho is really peculiar about his sound. He loves the sound. I love the portability and output. Very satisfied !! !